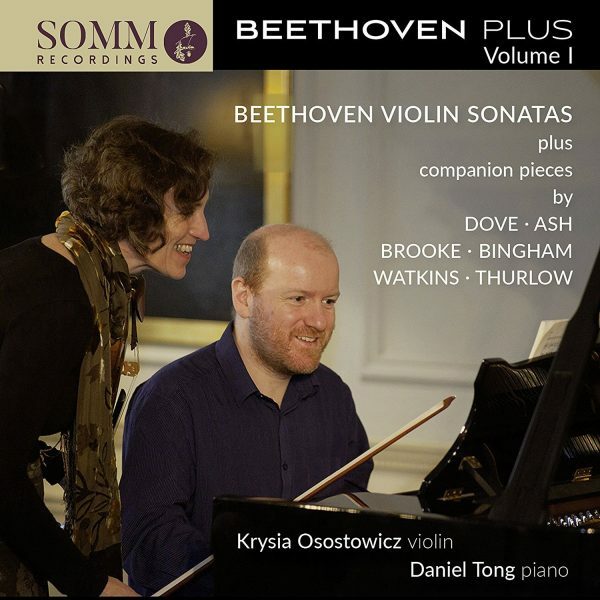 The launch of Somm Recordings’ inspirational Beethoven Plus series sees violinist Krysia Osostowicz and pianist Daniel Tong commissioning 10 leading contemporary composers to write ‘companion’ pieces for – and inspired by – Beethoven’s seminal set of 10 Violin Sonatas. The result is a fascinating conversation between past and present in which Beethoven’s mastery of the form receives illuminating – and often surprising – commentary from entirely modern perspectives. Volume 1 focuses on Beethoven’s first five Violin Sonatas – Opp. 12 (Nos. 1-3), 23, 24 – and the Third Sonata from his Op. 30. They are each coupled with first recordings of their new companion pieces. Jonathan Dove’s Ludwig Games is a glorious “upbeat” to Beethoven’s First Sonata in which motivic dynamism and minimalist accents are brilliantly matched. The punningly titled A Major Chase updates the humorous Second Sonata in a virtuosic display described by composer Peter Ash as “Bartók meets Tom and Jerry”. Imaginatively re-working the key of E flat, the characterful dissonance of Elspeth Brooke’s Swoop offers a decidedly contemporary response to the Third Sonata. Judith Bingham’s The Neglected Child pays a heartfelt homage to Beethoven’s Op. 23, while Huw Watkins’ Spring is a masterly miniature inspired by the radiant, lyrical textures of Op. 24. Jeremy Thurlow’s Mehlschöberl (one of Beethoven’s nicknames) alights on the wit of Op. 30 No. 3 to take two motivic cells from Beethoven’s score as the starting point for an intriguing and involving set of colourful transformations. Daniel Tong says: “The new companion pieces locate this set of recordings within a specific time – these composers’ responses to Beethoven coupled with our response as interpreters – leaving us with the thought that, in the end, all interpretation is work in progress”. Beethoven Plus was presented in a series of concerts by Osostowicz and Tong at the Kings Place, London in 2015 and has since been performed in leading venues around the UK.